This week, you can follow Lenovo Gaming streamers and win big prizes, including a Lenovo Gaming desktop and Razer accessories. If you'd like a shot at winning a Lenovo Gaming desktop or some Razer accessories, this new contest from Lenovo is just what you've been looking for. For one week, Lenovo Gaming streamers will be diving into the Dark Zone in Tom Clancy's The Division. You're invited to follow your favorite streamers, and when you do, you can enter to win a Lenovo ideacentre Y700 desktop sporting a NVIDIA Geforce GTX970. You will also be given the chance to choose which team of streamers you want to support during this event, and the people that back the team that get sthe most kills will be entered for a shot at a Razer Chroma suite (keyboard, mouse, and headset) or a Razer Kraken Chroma headset and mouse. You can also jump in and play alongside your chosen team to help them score more kills. 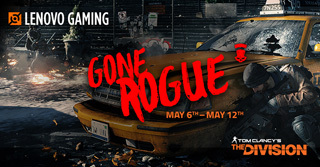 Enter your information using Gleam at https://www.lenovogaming.com/contests/gone-rogue/. You may choose only one team to support for this event. If you follow more than one team, or no team, your entry will be disqualified. You need to enter only once, but there are multiple ways to gain extra entries. You must be at least 18 years of age to enter and currently reside in the United States, Canada or the UK. Event runs from May 6 to May 12, 2016. All prizes will be chosen at random by May 31, 2016. Winners must present valid photo ID for verification. If a winner is unable to present an ID, Lenovo Gaming will keep choosing until it selects a qualified winner. This event is sponsored solely by Lenovo. All prizes are delivered from the winner's regional Lenovo distribution center, so the prize specs may vary depending on availability. For more info, you can check out the official contest page over on Lenovo's site.